Tim Scott spent his summers growing up in Pinedale and stalking trout all over Sublette County. After graduation from the University of Montana, he started a 27-year career in the US Air Force. Although his duties to took him the four corners of the world Tim continued to call Pinedale home and never missed a chance to return to fish our pristine blue ribbon waters. Tim’s fishing resume encompasses fishing from Maine to Alaska to the Gulf Coast and all points in-between. Trout, salmon, bass, or pike; he has chased them all with a fly rod. 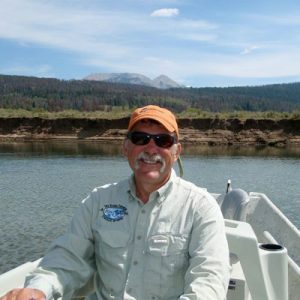 Following retirement from the Air Force in 2007, Tim relocated to Pinedale as a year-round resident and began guiding for Two Rivers that same year. He can be found on the rivers as soon as ice out and is one of the last anglers to call it quits in fall. Tim takes pride in working with novice fly fishers and mentoring them to land that first trout. Come fish with him and share his infectious love of our local waters.